As I alluded to in yesterday’s Sweater Thursday post, I made an epic dessert this Thanksgiving. Friends? I made a Cherpumple. 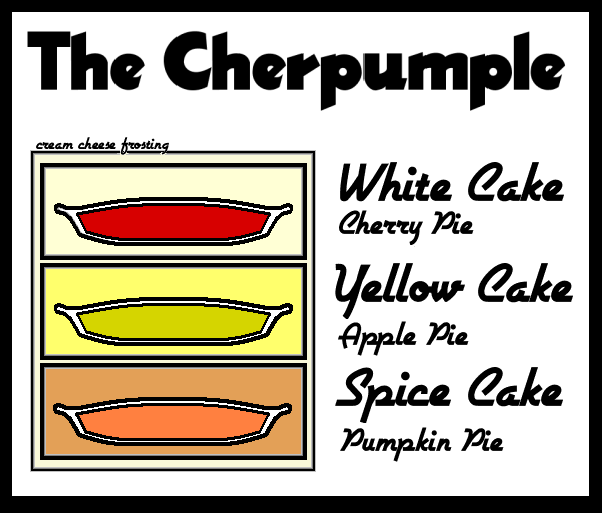 What is the Cherpumple? The Cherpumple is Charles Phoenix’s Americana dessert creation that flirts with the ridiculous. It is a three-layer cake. 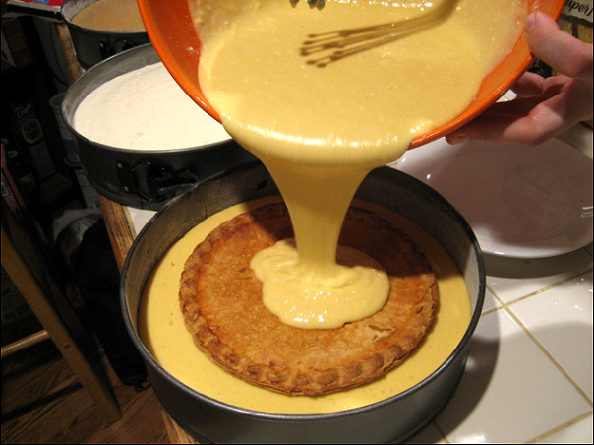 Within each layer of cake is a pie. I think we need an infographic. 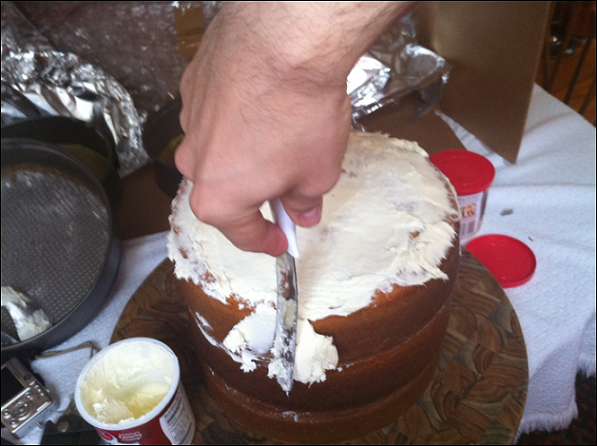 We followed this recipe, though modified the order of layering. You see, Vivienne’s friend Cam (her experience here) recommended a slight modification: the pumpkin pie on the bottom. 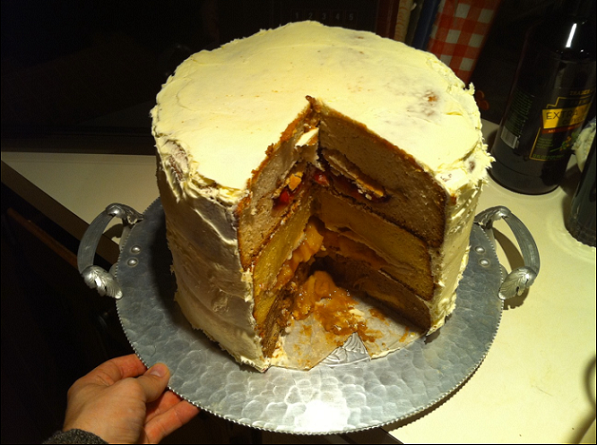 Apparently the structural integrity of this cake is far superior than the others, so the Cherpumple holds its form better with the pumpkin on the bottom and the apple in the middle. I was expecting it to be a little tricky to find 8 inch pies. 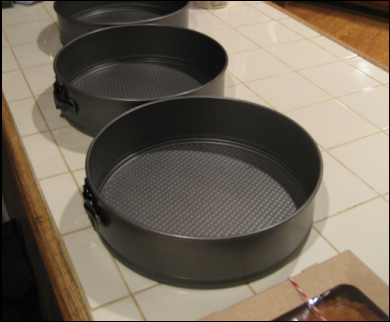 So when I originally purchased my pans, I opted for 9 3/4 inch spring form pans instead of your typical nine inch cake pan. This turned out to be a bad idea. We’ll explain why later. As it happens, it was extremely easy to find 8 inch pies. 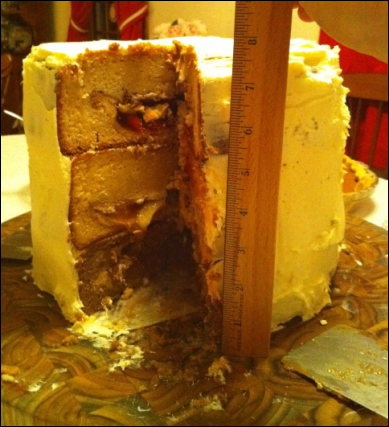 The actual making of the Cherpumple was amazingly easy. 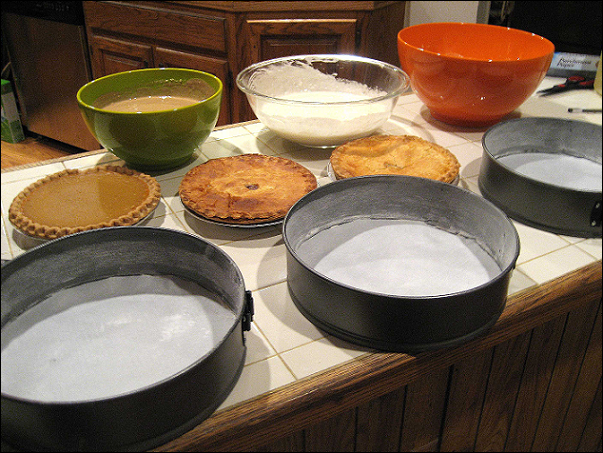 Vivienne decided she wanted to participate in the hilarity, so the two of us prepared the cake mixes, de-boxed the pies, and floured/lined the spring form pans. 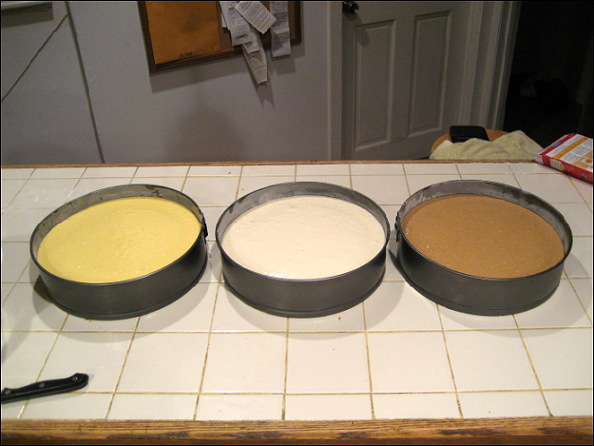 Upon pouring the cake batter and placing the pies, we quickly realized that with these larger sized pans, we’d need TWO cake mixes per layer in order to fully cover each pie. DAAAANG. We dashed to the store and purchased three more cake boxes. 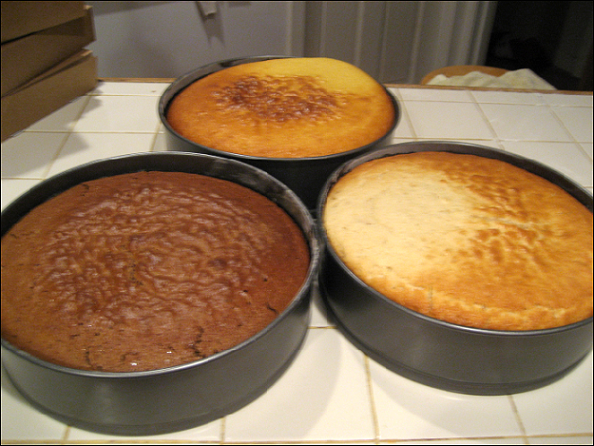 With the largeness of these cakes, I had to bake them for an hour instead of the recommended 30 minutes. 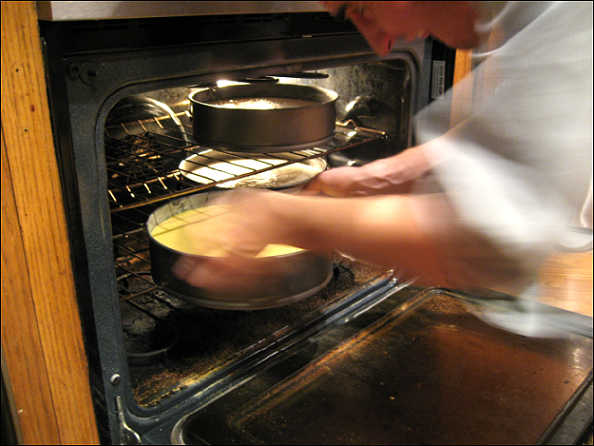 Thankfully, my oven was plenty large enough to handle three cakes. The assembly went fairly well. 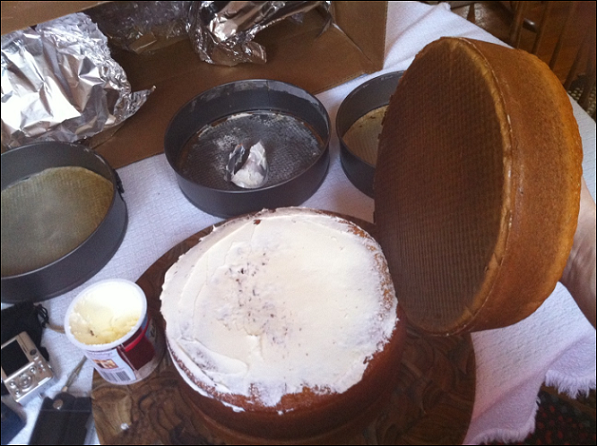 The double cakes were structurally very strong and they stacked/stuck beautifully with a little cream cheese frosting. 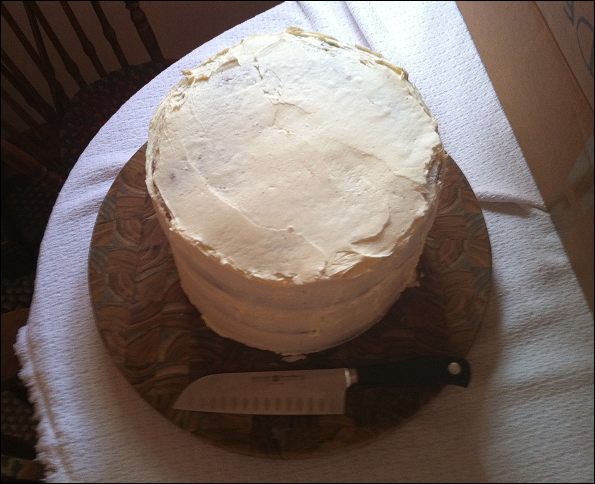 Since my family was having Thanksgiving on Cape Cod, I decided to bring the cakes unassembled to my Thanksgiving destination and then build it and frost it there. This was a wise decision. 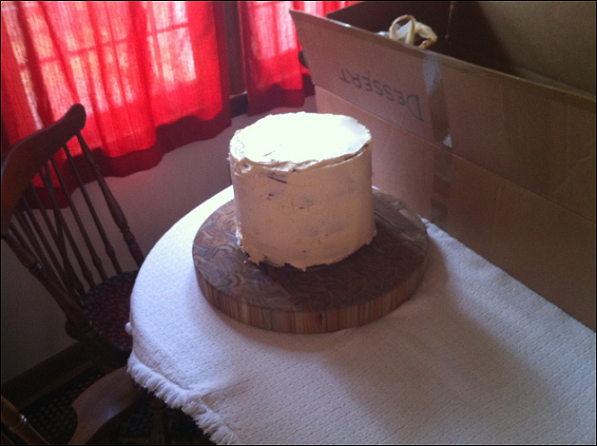 The following is a Vimeo movie that documents the Cherpumple reveal! Cherpumple from mikedidonato on Vimeo. The Layers! The Glory! The Cherpumple! What an amazing experience! 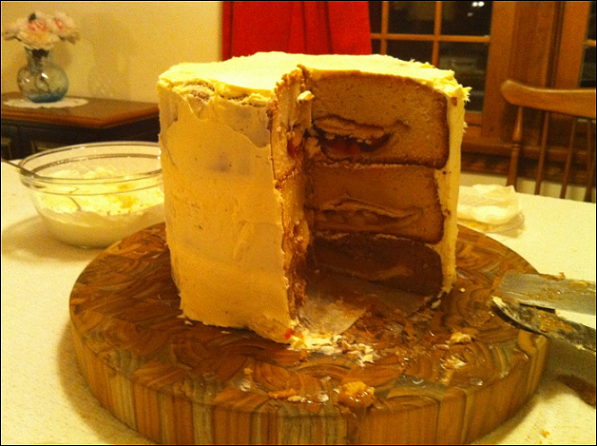 I strongly recommend the Cherpumple to anyone who is looking to inspire awe and astonishment. Mike D, you are obviously skilled. Mike. How much did it weigh? and can you calculate out the caloric explosion that treat caused. The cake, in its entirety was over 23,000 calories. I’ll calculate the weight and get back to you on that one. It is a very crazy cake ! Looks yummy! Can i have one bite? You are a men among men! I have tasted the Churpumple. And let me tell you, it does not disappoint. Like…whoa. I thought it’d be a little off, but noooooo sir, it’s solid delicious with frosting inbetween. Cam recommended Apple at the bottom for structural integrity, not Pumpkin. Because Pumpkin is soft and weak. But don’t worry Pumpkin, you are still delicious! so awesome. I wonder how it would do with cheese cake or pecan pie on the bottom…perhaps higher compressive strength or at least a higher yield stress. I liky! :-) When do I get to try it?